Alexa and Mark talk about solutions from Myostat Motion Control Inc. Integrated motors spin and integrated actuators dance. There was a lot see this year at this unique venue. On October 30th, 2013, you can find us at the Design Engineering Expo in Toronto. The Vancouver show was a great success and we are looking forward to networking in Toronto. 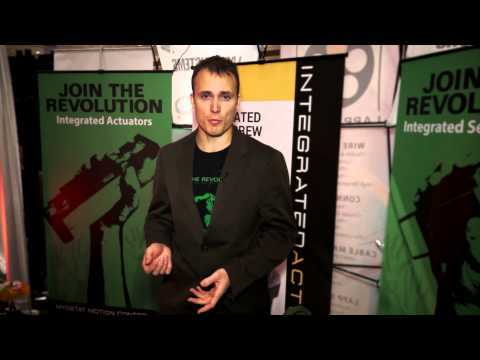 IntegratedActuators.com is pleased to announce the NEMA11 or 28mm square integrated stepper motor. This system includes a smaller CAN2.0B 242 intelligent drive+controller, along with a magnetic encoder for position feedback, and I/O for sensors or signals from a PLC. Please contact us directly for additional information, pricing and availability. The CS-17 was recently spotted in an X-Y fixture for electronic product production. Two captive screw actuators are being used to push a multi-axis stage with spring loaded guides. A camera mounted above the fixture is used the close the position loop while the controller guides the fixture into position. The CAN2.0B intelligent drives were used for multi-axis networking, providing a high speed communications bus to the controller. These fixtures will see hundreds of thousands of cycles producing consumer electronics in this highly competitive market segment.